Izmir is the third largest city in Turkey situated in the south of Turkey on the shores of the Aegean Sea. Izmir boasts one of Turkey’s major commercial and military sea ports on the Aegean coast. The city of Izmir in Turkey lies between the bay on the coast and a string of mountains in inland Turkey. Izmir has a lovely waterfront promenade that makes for pleasant walks as well as many cafes where you can take a break. 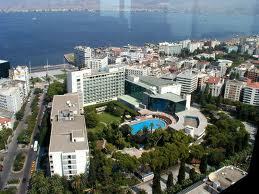 Izmir is a very modern looking Turkish city with wide roads and modern buildings. Despite its modern architecture Izmir has a rich history. Izmir was known as the Turkish town of Smyrna up until 1923 and had been ruled by Alexander the Great and the Romans among others. The famous Greek poet Homer who is considered the father of the western literary tradition lived in what is now the Turkish city of Izmir in 700BC. Izmir became a major trading city in the 16th Century when the Ottoman emperor Suleiman allowed European merchants to live and work in Izmir. Gradually Izmir began to take on more European influences until the Christian and Jewish inhabitants outnumbered Muslim Turkish people in Izmir. In 1922 Izmir was invaded by Greeks who occupied it briefly. When the Turkish army pushed the Greeks out of the city the city was destroyed by a fire that started before the Greeks retreated to Greece on ships waiting in Izmir harbour. The great fire of Izmir allowed the Turkish city to be rebuilt on modern lines. The main bazaar in Izmir is located in the centre of the city near the old Ottoman government mansion which still stands today and is known as Konak. The Izmir bazaar is quite vast and a couple of hours can easily be spent touring it and doing some shopping. Goods on sale at Izmir bazaar include traditional Turkish handicrafts including rugs, carpets and bronze ware.